Litigation lawyers, also known as litigation attorneys, litigators, or trial lawyers, represent both plaintiffs and defendants in civil cases and manage every phase of the litigation process. Many people assume that litigation means trial, but in fact the litigation process begins before anyone even enters a courtroom. To determine whether or not your legal issue is within the litigation category, you must figure out whether or not a lawsuit would solve your legal issue. If a lawsuit would solve your legal issue, then the case qualifies as a litigation and you should retain a litigation lawyer or litigation attorney. In typical litigation cases, the parties involved first discuss the legal issue with each other directly. If and when it is clear that the two parties cannot agree, one or both parties need to retain a litigation lawyer. The next step is for the litigation lawyer to send the other party what is known as a ‘demand letter.’ This demand letter will describe what the party receiving the letter must do in order to avoid any further legal action (most commonly such letters demand payment or the stopping of a specific activity). When responding to receiving a demand letter, you may issue your own demands, do nothing at all, or respond with negotiations. If these initial negotiations do not resolve the dispute, one of the parties will need to file a formal lawsuit and both parties will need to be legally represented. Pleadings – each party within a lawsuit file the initial papers (aka pleadings) which explain each party’s side of the dispute. The litigation begins once the plaintiff has filed a complaint with the court and formally presented a copy to the defendant. The defendant is then given a set amount of time during which they can file a response to the complaint, presenting their side of the dispute. The defendant is allowed to file counter-claims against the plaintiff and in turn the plaintiff can respond to these counter-claims by filing a reply or by requesting that the defendant clarify and/or correct factual deficiencies, which can lead to amended complaints and replies. Once these activities have been completed, the issues for resolution by the court have been officially defined and litigation can proceed to the next step. Discovery – the method by which relevant information is gathered by each party; usually the lengthiest part of the legal case. Key methods of obtaining information include interrogatories (written questions), requests for copies of documents, requests for a party to admit or deny statements of fact, and conducting depositions (witnesses are questioned under oath). Support from expert witnesses is often used to validate an argument and it is best to obtain the services of an expert witness sooner rather than later in the discovery process. Trial – the parties each present evidence in support of their claims and/or defenses to a judge (and potentially also a jury, if it’s a jury trial rather than a bench trial) in court. Before trial begins, each party provides the judge with a document (a brief) that outlines both the arguments and evidence to be used at trial. Each party presents their case, evidence, and witnesses, with the plaintiff going first, followed by the defendant. Once all of the evidence has been presented by both parties, closing arguments are conducted, followed by deliberation and a decision/verdict. Appeal – if a party is not satisfied with the result of a trial, they can apply for an appeal. In an appeal, both parties’ arguments and the records from trial court are submitted to the appellate court, and the appellate court usually only reviews cases for legal error (very rarely will they review factual evidence). Alternatives to Litigation – alternatives to litigation can save time and money, but may not fully resolve the dispute. Alternatives to litigation include settlement, mediation, and arbitration (mediation and arbitration involve a neutral third party). The rules for filing and responding to a litigation lawsuit can be quite complex, and without expert legal assistance small mistakes can be made that have a lasting and drastic effect on the case. The pre-trial states of litigation can take years, and even after the trial has ended it is possible for the losing party to appeal the court’s decision, which further extends the case. Although many states have implemented rules and procedures to make the litigation process more accessible to individuals who are inexperienced in litigation law, there really is no substitute for experience. The act of hiring a litigation lawyer to consult, advocate, and/or enforce your legal rights is the best plan of action in this case. 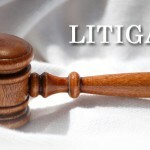 Contact LegalHelpLawyers.com to speak with an experienced litigation lawyer today!